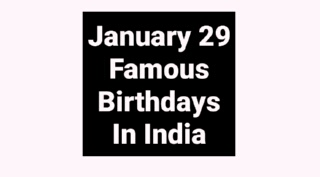 In this post -- Famous Birthdays January 29 Bollywood Actor Actress Cricket Politics, check who are sharing your birthday in India 29 January's famous birthday personality in India like Bollywood actor, actress, cricketer, politician and all famous Indian celebrity. Meera Vasudevan (born 29 January 1982) is an Indian film actress and model, who has appeared in Malayalam, Tamil, Hindi and Telugu-language films. Meera was born in Mumbai, Maharashtra in a Tamil brahmin family as the eldest daughter to Vasudevan and Hemalatha. After graduating with a Bachelor of Arts degree in Psychology and English literature, she became a successful model. Veturi Sundararama Murthy (29 January 1936 – 22 May 2010), popularly known as Veturi, was a Telugu writer mostly popular for his film songs. His career in the Telugu film industry spanned more than four decades. Veturi was born to Chandrasekhar Sastry and Kamalamba in Pedakallepalli, near Challapalli, Krishna, in an orthodox Telugu Brahmin and native of Peda. Divyank Turakhia (born January 29, 1982) is a serial entrepreneur. Turakhia started his first internet business in 1996 at the age of 14. He co-founded the Directi Group (www.directi.com) in 1998 as a two person start-up with $600 and became a millionaire at age 18. His net-worth today stands at over $350 million. Jogendra Nath Mandal (January 29, 1904 — October 5, 1968), was one of the central and leading Founding Fathers of modern state of Pakistan, and legislator serving as country's first minister of law and labor, and also was second minister of commonwealth and Kashmir affairs. An Indian and later Pakistani statesman. Rimpy and Prince are a Punjabi Film and Music video director duo. They are known for directing songs in the Romantic and Nostalgic genres. They have cast Gurdas Maan in their first Punjabi Film Mini Punjab (2009) Rimpy (alias Padamjit Singh) and Prince (alias Harpreet Singh) are brothers by Birth and are from Jalandhar. This director duo work under the banner of Rimpy Cine Sound Master. Bhavya Gowda (Kannada – Bhavya meaning ‘Splendid, Auspicious, Excellent’); born on 29 January 1984) is an Indian Model, who became the first Indian Beauty Contestant to be crowned Miss Earth Northampton (Midlands UK) in 2010. She was crowned at the age of 26, following a two-day competition at Blackpool on 22 September 2010. Francis Leo Braganza (January 29, 1922 – December 21, 2011) was an Indian Jesuit priest. He was the bishop of the diocese of Baroda, Gujarat, from 1987 to 1997. Francis Braganza was born in Mumbai, India, ordained a priest on November 21, 1951 in the Society of Jesus. Braganza was appointed bishop to the Diocese of Baroda on April 27, 1987 and ordained bishop June 29, 1987. Balantrapu Rajanikanta Rao B.A. (born January 29, 1920) is the son of "Kavi Rajahamsa" Balantrapu Venkata Rao who was one of the modern Telugu poet-duo Venkata Parvateswara Kavulu. He is a well-known writer, composer and poet in the Telugu language. He has won several national and state level awards for his work. Rajanikanta Rao started his schooling in Pithapura. V. Radhika Selvi (born 29 January 1976) is a member of the 14th Lok Sabha of India. She is the Minister of State for Home Affairs in the Manmohan Singh led ministry. She represents the Tiruchendur constituency of Tamil Nadu and is a member of the Dravida Munnetra Kazhagam (DMK) political party. She is the wife of the late Venkatesh Panayar. Mosalikanti Thirumala Rao (b: 29 January 1901 - d: 1970) was Indian Freedom activist and Parliament member. He was born to Shri Bayanna Pantulu in Pithapuram, East Godavari district, Andhra Pradesh, India. He joined Indian Independence movement on the call of Mahatma Gandhi and actively participated in many activities and also jailed many a times. Chrispus Livingstone (born January 29, 1949), is a botanist, educator and multifaceted person. Among his varied interests is the taxonomy of tropical plants, especially flora of Chennai, then Madras. He is perhaps best known for his book The flowering plants of Madras City and its immediate neighbourhood. Born in Kanya Kumari, Tamil nadu, He passed his SSLC from Arumanai high school, Kanya Kumari. Oswald Cyril Smith-Bingham (29 January 1904 – 27 January 1979) was a South African born Indian cricketer. He played three times for the Egypt national cricket team against HM Martineau's XI in the early 1930s and later played two first-class matches in India for a Viceroy's XI, including one against the MCC.